The hilarious Doggie Doo action game! Feed the dog, throw the dice and take turns to pump the lead. If he poops on your turn, scoop the poop and it’s the first to three poops wins! Board game information: 2-4 players. General information: For ages 4 years and over; EAN/MPN/UPC/ISBN: 5020674945204. WARNING(S): Not suitable for children under 3 years old. 3 Questions 3 Answers Kids will love this fun Doggie Doo action game! Feed and walk your little dog, and if he poops, you scoop that poop! The first player who has 3 pieces of dog mess on his shovel wins the game!For 2 to 4 players. This toy costs approximately £22.99 (for the latest and best prices make sure you check our retailer list for the Doggie Doo Game above). 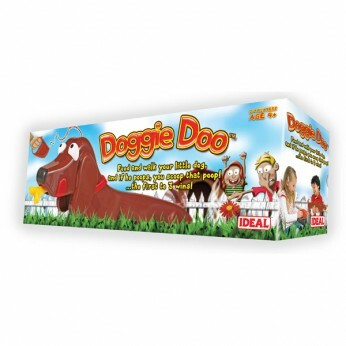 In our review of Doggie Doo Game we classed it as being suitable for ages 6 years, 7 years, 8 years but recommend you check the manufacturer specific advice before purchasing.